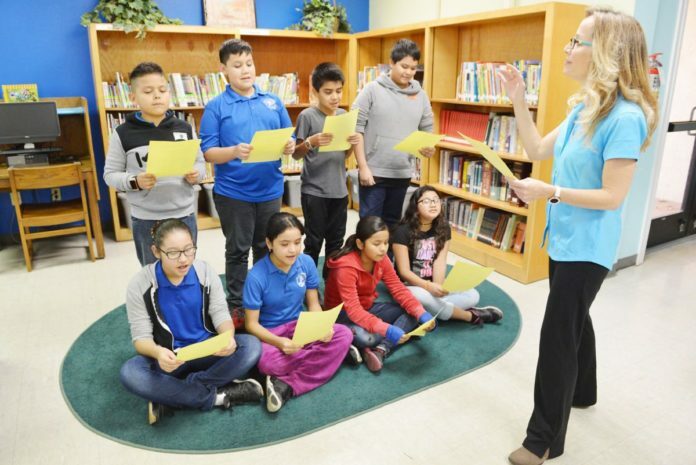 Resaca Elementary music teacher Renee Lockett conducts as her students sing their Pelican Song, which received statewide recognition for the song they wrote and posted on You Tube that brings awareness about brown pelicans who die by motorist due to cold weather along Gayman bridge and the Queen Isabella Causeway. The brown pelicans of South Padre Island have a bunch of cold-weather friends at ResacaElementary School in Brownsville. One year ago, the students, then fourth-graders, and their teacher wrote a song about the problems the pelicans experience every time a stiff-enough cold front blows in from the north. Due to structural features of Highway 48 between the Bahia Grande and the Brownsville Ship Channel, when the wind is just right out of the north or northwest it creates conditions that push flying pelicans down to the roadway. Music teacher Renee Lockett brought the situation to the students’ attention after hundreds of the birds died in December 2016. We heard that cars are hitting you. We want to help, so we’ll sing for you.